In Russia, business is formal, professional and taken seriously. Russians do not consider it necessary to establish long term connections with all their business partners. 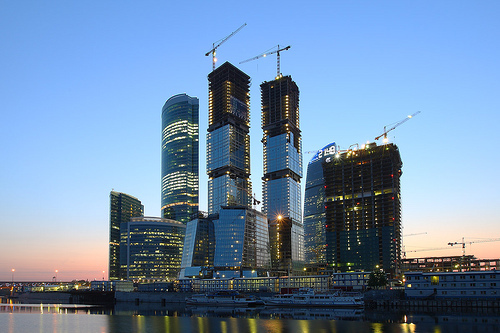 However, it is a good idea for companies to make a network of business connections to overcome red tape, as Russia is a very bureaucratic nation where matters operate slowly. Natives and foreigners must have a great deal of patience to wait for things to pass. Foreigners must take precautions when dealing with Russian business. It is suggested to avoid dealing with unregistered companies, or companies that only list cell phone numbers. Legitimate businesses will provide contacts with email addresses and land lines. Sometimes if foreigners are planning to do business with a Russian company, the company will set them up with a Russian host to show them around the city to go sightseeing, help them with learning Russian and try to find them a good hotel room. They may even invite foreigners to participate in some local customs like going to a Russian banya (bathhouse), or taking some vodka shots at a bar or at someone’s house. When meeting people for the first time, it is a good idea to act formally. You should try to be as sincere as possible, as that is how people will learn to trust you. When Russian business partners learn to trust you, they will ask you to do a favor for them. In terms of meetings, appointments are necessary. You should make an appointment as early in the future as possible. If you are planning on meeting with a government official, you should aim for at least six weeks in advance. Avoid scheduling meetings around the first week in May, as most people are off work for national holidays. Even if you make a date, realize that Russians constantly change their calendars, so it may be rescheduled. They can be canceled with very short notice. The first impressions are important; do not show up late for meetings, as that is considered sloppy. Dress conservatively, in dark colors, and have your shoes polished. Expect a long period of small talk before anything important is discussed. You should spend a good deal of time explaining why your Russian contacts should chose to work with your company as opposed to your competitors. Do not appear hasty or pushy with your negotiations. You should have your material printed in both your native language and in Russian. Expect to spend a while listening to Russian presentations, as they tend to include an immense amount of information. Meetings will probably get interrupted by several sidetrack discussions that will also go on for a while. Do not be surprised if people lose their temper or walk out of the room during negotiations. At the conclusion of the meeting, the Russians may come up with a “protokol,” summarizing what was discussed, and request that you sign it. Nothing in meetings or negotiations is final until a contract is signed. On your business card, you should have one side translated into Russian with Cyrillic text. You should also have your university degrees and accomplishments listed on your card. Tanya obviously understanding her subject very well. All her advice is accurate and useful, quite an acomplishment when writing about Russia! Along with her other cautions, I would remind Americans to speak quietly, as many Russians think Americans are shouting at them when actually they are not. My Russian wife and I have lived in St Petersburg Russia since 2000. It is a particularly challenging country for foreigners, but worth the effort. Her advice to be patient is especially important as the ability to not give up is admired. With much patience most expats will grow to appreciate living in this fascinating country.